THE BIO-N-LIVEN ANSWER® is a highly concentrated, multi-component biostimulant containing a complete system of an ecologically balanced mass of autotrophic, aerobic, and anaerobic enzymes, co-enzymes, exo-enzymes, multifactorial inducer molecules and vitamin precursors of plant and animal origin. Each enzyme was specifically chosen because of their effectiveness in meeting the needs of soil component breakdown and nutrient release. Among other benefits, these groups are most proficient in the conversion of ammonium-nitrate to nitrate-nitrite; cellulose degradation; fat, triglyceride, and protein breakdown; oxygen production; and pH balancing. 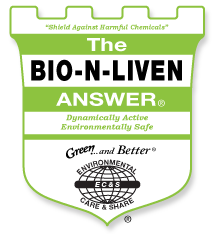 THE BIO-N-LIVEN ANSWER® doesn’t contains any living microorganisms. DISCLAIMER: Microbial multiplication can be reduced or inhibited with the use of (1) antibiotics, (2) disinfectants, (3) copper sulfate in footbaths or ration, and (4) chlorinated water, high or low temperatures and pH factors.